How else to explain why so many are joining beauty contests and, win or lose, more often than not, marrying a rich guy? A penniless, pretty lass with bountiful physical assets in, say, showbiz, has more chances than others of attracting and bagging a representative, a senator, a businessman, a somebody with huge financial assets. The Vilma Santos-Ralph Recto romance is like a Cinderella story except that by the time Vilma married Ralph, she was no longer a pauper. She wasn’t looking for a prince or a moneyed papa, for, after all, she was the multi-awarded actor Vilma Santos, the Star for All Seasons. In other words, he was rich, and she, too, was rich. The difference is that he was born rich, and she was not to the wealthy born. The love story began 20 years ago, in July 1985. For the first time after a one-and-a-half years of being separated from then husband, actor Edu Manzano, Vilma came out of seclusion. Although Vilma and Edu were living separate lives, residing in different houses, Vilma remained constant, maintaining a semblance of fidelity, because, she reasoned out, she was still legally his wife. She didn’t want to give people an opportunity to wag their tongue, to misunderstand or judge her, she avoided getting stoned by negative opinions of her. But when she found out Edu was dating other women, she decided it was time for her to have fun herself, to spread her wings, and to find a life. “Ba’t ako magpapaka-martir?” Vi pouted. Finally heeding friends who had been advising her to go out and enjoy herself, she dressed up and accepted an invitation to King Kong disco bar, which was owned by director Marilou Diaz-Abaya. So, there she was chatting and laughing with friends Marilou Diaz-Abaya, Maryo J. delos Reyes, Charito Solis, Charlie Peralta, and Greg de Guzman, swaying and stomping under the strobe lights, and feeling free. Then, a tall, mestizo guy approached Vilma and introduced himself: “Excuse me, my name is Ralph Recto. May I have this dance with you?” Vilma snubbed him; no, she did not want to dance with that boy. Was it because she didn’t know him or was it because she was still hurting from a failed marriage? The guy was persistent and patiently waited until he asked her again. Charito Solis nudged Vilma: “Four am na, pagbigyan mo na, isayaw mo na.” And so, the reluctant Vilma danced with Ralph. While dancing, reports Vilma, Ralph asked her: “Do you know my father?” “No,” Vilma answered. “Do you know Assemblyman Raffy Recto?” Ralph continued. “No,” Vilma replied. “Are you interested in politics?” Ralph ventured. “No,” Vilma shrugged. After the dance, he asked Vilma: “Are you coming back here next Saturday?” Vilma: “Maybe.” Then, he got her phone number and brought his partner back to her table. “At my first glimpse of her, I found her attractive,” say Ralph, “I didn’t know that she was the Star for All Seasons, so to speak.” It was only when he went back to his table that he found out who that attractive young woman was. His barkada from Greenhills told him that the person he was dancing with was Vilma Santos the actor. All he knew was she was named “Vilma” and that she was “A joyful person.” The funny thing is he had only recently seen the Vilma starrer Sister Stella L. Vilma surmises that maybe he did not recognize her because she was wearing an off-shoulder attire, which was, of course, very different from a nun’s habit. Ralph called up Vilma the following day, and “she obliged me to meet with her again the following week in the same place, the same disco.” “Why? Well, Vilma’s first impression of Ralph was that he was “Very intelligent, down-to-earth, tisoy (mahilig ako sa tisoy).” And so, they did see each other again a week later. Another week after, recalls Ralph, “we had a private dinner. I felt we would have a meaningful relationship. ”That private dinner was with his parents in Greenhills. Vilma was at once nervous and excited. They knew her background, she didn’t hide from Ralph who or what she really was – that she was 32, that she was married, had one child, had been grist for gossip columnists, had not had higher education, etc. By this time, Vilma knew he was only 21, single, a graduating student at the De La Salle University taking up Economics, and a member of an illustrious Spanish-speaking family. Edu Manzano, meanwhile, drifted further away from Vilma. Being an American citizen, Edu had married Vilma in Las Vegas, and then porced her in Guam. Three to four months after their first encounter, Vilma and Ralph went MU, or mutual understanding, which is the first stage of today’s couples’ relationship. Mutual understanding meant that they could see each other as often as they liked, but neither one was committed to the other. In other words, in principle, both could go out on a date with other persons, but they might show a special devotion, a special friendship, love and understanding —that is, the two on MU—for one another. Those happy, carefree days would see Ralph attending the shooting of Tagos ng Dugo by Maryo J. He would come from school, stay in his car, wait for her, and then bring her home to Magallanes. In Magallanes, Vilma recounts: “Magkukuwentuhan kami ni Ralph tungkol sa lahat ng bagay, about everything under the sun. Inaabot kami hanggang sa pagdating ng diyaryo ng 6:30 am. Hindi naming namamalayan na maliwanag na pala, na umaga na.” Vilma sizes Ralph up: “Matalino, maraming alam, pero hindi mayabang. Inisip ko na marami akong matututunan dito.” They enjoyed each other’s company while going places, eating pizza, and having “gimmicks” and so on. Vilma analyses his appeal to her: “Baka nadala niya ako sa kabataan niya, kasi di ko naranasan iyon noong bata ako.” She concentrated on her work as a child, and has done almost nothing but work ever since. “You know,” Vilma warned him, “hindi ako madaling maging asawa. Mahihirapan ka, kilala ako sa Pilipinas.” It would be quite difficult for him to do any hanky-panky because he would easily be found out since Vilma is so popular that almost everything and anything the nosey press would sniff would immediately be reported in the media. The brave Ralph was not intimidated, and at 2 pm of December 11, 1992, they officially tied the knot in a splendid wedding ceremony in Lipa, Batangas. Some 500-700 guests from politics and showbiz witnessed the exchange of vows. It must have been a relatively blissful union since they already had a chance to get to know each other up close when they were living in. Relates Ralph: “For me, the most trying period in our relationship was the first seven years.” The proverbial sevenyear-itch happened to both Vilma and Ralph before their wedding. Ralph lived in his condo in Greenhills, but he telephoned Lucky almost every day, pretending or so it seemed, that his concern was only Lucky and not Vilma. Like other typical couples, they undergo moments of discord. Sometimes, even when they’re in a bad mood, they still greet each other good morning and good night with a kiss, but a quick, cold one, like they’re merely fulfilling an obligation, a task, so that they can attend to other “more important” matters of the day. However, no problem is unsolvable. Sometimes, they let a month go by in ill humor until things cool off a bit. At the end of 30 days of silence, they would go” “Can we talk?” They find dialogue most effective. No vitriolic physical or verbal barbs, just civilized talk. In the last five or six years, Vilma and Ralph have tried to spend more time with each other in spite of their busy schedule. They have been traveling alone, just the two of them, and sometimes with their children Lucky or Luis, now 24 years old, and Ryan, aged 9. Together, they go swimming, bowling, boating, meditating, playing golf, watching television, etc. Right after Ate Vi, aka Mayor Vi, was given the Gawad Plaridel last July 4, 2005, which is sponsored by the University of the Philippines College of Mass Communications, at the Film Institute’s Cine Adarna, husband and wife took a grand vacation. They spent 14 days in Europe, came back to the Philippines for a while, and hied off to Los Angeles, USA, for five days, and to New York and New Jersey for four days. In New Jersey, Vilma cut the ribbon at the opening of the four-year old Philippine Fiesta Exposition Center. “She’s an excellent mother,” gushes Ralph. “ She takes good care of me and her children. She’s a loving person. Sometimes, she’s hardheaded. But I can live with that. I’ve learned to live with it. And sometimes, I could be hardheaded, too. (Smiles) I’ve no complaints. She is what she is and I love her for what she is. She’s now more concerned about social and political issues.” How does Ralph for his part keep their relationship going? “We count our blessings. Both of us have been blessed.” Although Vilma doesn’t cook, she sees to it that the cook, upon her culinary guidance, serves Ralph his favorite dish such as baked pasta, which contains corned beef, cream of mushroom, parmesan cheese, and sweet corn. Says Vilma: “My immediate family comes first. I do my part as a mother and as a woman. I don’t plan my life. It’s enough that I live comfortably, my family is fine.” Their terms of endearment for each other are “Papa” and “Mommy.” Has the tag ‘Mr. Vilma Santos’ ever, ever affected Ralph at any point in his life? “No, it has not affected me in a negative way,” explains Ralph, “It has helped me tremendously. In fact, Ralph will always happily remember “achieving milestones in our life together—getting married, having children, watching them grow up, participating in school activities, helping each other make our community better. Of course, traveling together. I suppose our happiest times are yet to come—which is, growing old together.” The Vilma Santos-Ralph Recto romance, despite all the zigging and zagging, sounds almost like a fairy tale. Yes, perhaps, politics and showbiz do go together. 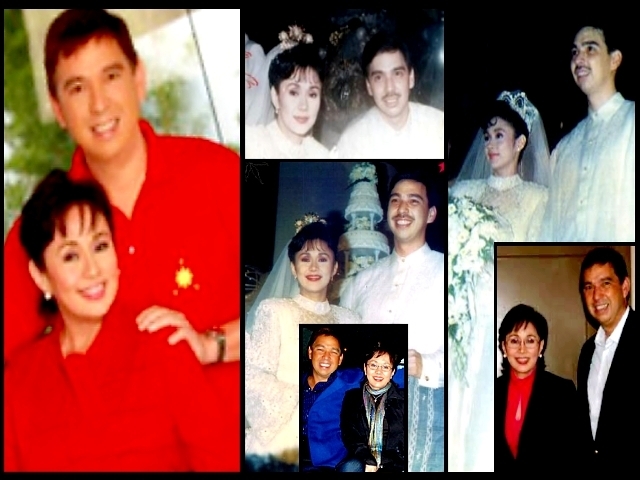 The wedding of Vilma Santos and Ralph Recto was a union of stellar figures in showbiz and politics. Santos is known as the Star for All Seasons and has a huge following from the Filipino audiences. Recto, on the other hand, came from a prominent political family from the province of Batangas. Their wedding which was open to the public created a huge buzz. Being one of the country’s most popular and respected actresses, the people wanted to know every move and possibly every major decision taken and made by Santos. This popularity became one of the reasons why her marriage to Ralph Recto was highly publicized. Another reason why it became talk of the town was because the marriage was not only about Santos marrying some typical guy but a prominent member in society. Their lavish wedding created media frenzy and the public wanted to know every bit of detail that went with the occasion. This wedding proves that there’s no such thing as keeping it low in the worlds of showbiz and politics (Top 10 Biggest Filipino Celebrity Weddings). This entry was posted in ARTICLES and tagged Ralph Recto, The Vilma Santos-Ralph Recto Romance (Repost), Vilma Santos, Vilma Santos-Ralph Recto. Bookmark the permalink.